Promo's, edits, mega-mixes, the record pools, white labels, acetates, reel to reels. All of the above were the weapons of choice for the disc jockey's of yesteryear, utilising these tools helped various luminaries pave the way for where we are today on the modern dance-floor. Those 'secret' mixes, 'private' versions and edits of the hottest Disco jams that only the select few had access to could make or break a DJ's reputation in the clubs and on the streets. It is within this world that the For Discos Only label operates, sourcing the finest underground edits and mixes for the Discotheques. We carefully hand pick and dig for obscure or forgotten versions of the best tracks that may have been previously out of reach for the majority, inviting the hottest editors and mixers to open up their archives and share their secret weapons with us all via the medium of the 12" record. Our second offering pulls together 2 of THE biggest edits from the last 20 or so years, so big in fact that they are regarded as classics of the genre. 2 absolute monsters that now fetch tidy sums in their original forms. 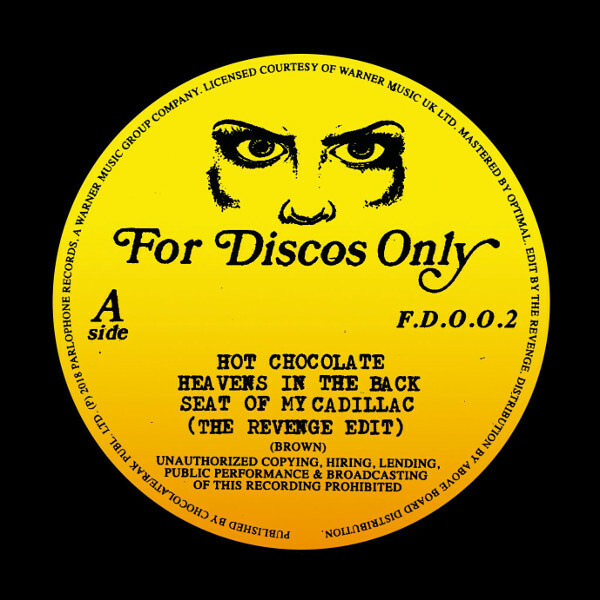 That's right, we've asked the mighty Revenge to give us their versions of BOTH Hot Chocolate's 'Heaven's In The Back-Seat Of My Cadillac' AND Gwen McCrae's 'Keep The Fire Burning' and they agreed! We then cleared both of these versions to be released on FDO with the license owners and catalogue controllers, had them remastered and pressed onto a high quality 12" for your maximum playback, dancefloor pleasure. This is one essential 12" for any serious lovers of the Boogie, Funk, Soul and Disco underground, boasting 2 of the largest reworkings to ever come out of bonnie Scotland. Do not sleep on this! These versions are designed to remind the dance-floor of where we came from musically in a respectful, modern fashion. Giving a nod to the pioneers who came before us in the DJ booth. Absolutely essential tracks for the late night dancers. All mixes are 100% legit, licensed and sanctioned. For Discos Only is a BOOTLEG FREE zone. Too legit to quit. Artwork by planetluke.com. Remastered by Optimum Mastering, Bristol UK.